Pain is my constant companion. It is always with me and after all this time we have become quite well acquainted with each other. I cannot think of a 24-hour period in the last few years where I have not been in pain. Some days it is merely a twinge and a twitch, but most days it is a nagging constant. It gnaws at me grinding me down until I am weary. I sometimes wonder if there are tiny teeny creatures inside of my bones eating away and snagging my nerve endings until I have to stop and simply sit waiting for medication to kick in. Each of us feel pain in a different way, and nobody can really know how you feel. A frenemy (it is a real word), is a person with whom one is friendly despite a fundamental dislike or rivalry. A combination of a friend and enemy. Pain has become my frenemy because I cannot avoid it – it is closer to me than my partner, family and friends and although I don’t like it I have to learn to live with it. The primary source of my pain is Arthritis in my hands. In addition I was recently diagnosed with Fibromyalgia which is also sometimes called the chronic pain disease. Add Pernicious Anaemia a blood disorder that leads to neuropathic pain and you have a good cocktail. This post is not about my pain, but rather my relationship with it. It is part of my life now, and so I need to make a friend of it (or frenemy). I am determined that my life will continue to be full despite my friendly enemy. These are a few of the techniques I am using to deal with it. I find that this is probably one of the best sources of pain relief. The pain doesn’t go away, but as I absorb myself in other activities my mind begins to wander and I am able to deal with it better. Unless I am in a very bad way, I tend to take pain meds when I need them. I am conscious of my overall health and try to limit what I do take. Once again however, keeping pain at bay is all about being regular with medications and other pain management aids such as topical pain relief in the form of sprays, gels, Versatis plasters and more. I used to be one of those people who boasted about getting on well with only 6 hours sleep a night. A wise physiotherapist reminded me that the body heals while it sleeps. I can honestly say that despite waking in the night in pain, the longer I sleep the better it is. My pain is primarily in my hands and arms which makes things a little awkward. What I have figured out is that I can do about 40 minutes with my hands without too much pain. Then I rest – and return to my task a little later. This has not only taught me patience but it also means that I get things done despite the pain. 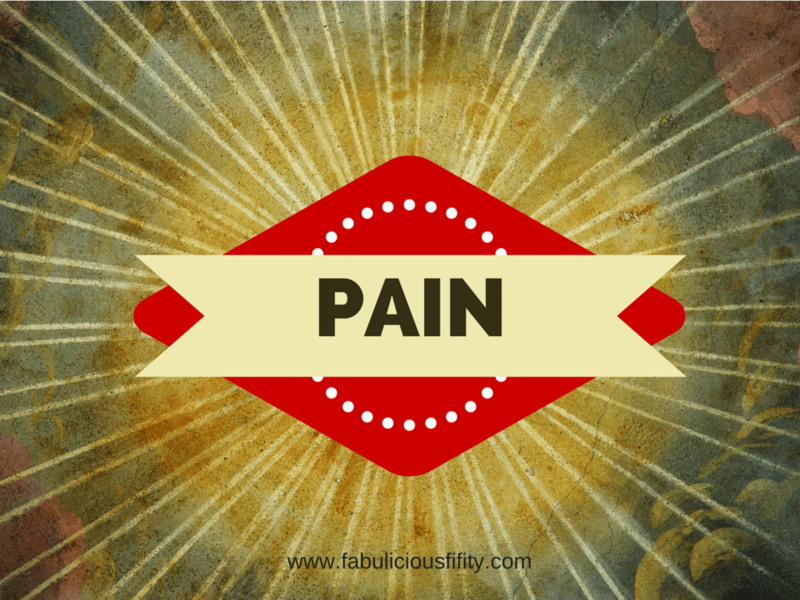 My journey with my frenemy pain is exactly that – a journey of getting to know pain and to understand it. To work with it and not against it. Each person’s pain is specific to them. If you have any tips of techniques on pain management I would love to hear about them. A while ago I was interviewed on CRCFM a local radio station – some of what we discussed is very relevant to this post. You can have a listen here. I have had a relationship with insomnia for many years. I think I have it under control and then wham another night with two ten minute naps and I am sitting at work struggling to focus. 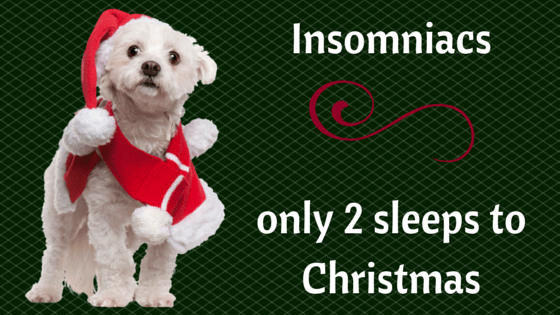 It was so bad at one stage, that my sister kindly send me a version of the image attached, reminding me that as an insomniac I only had two sleeps to wait until Christmas (6 months ahead). After a particularly bad bout of sleeplessness recently a friend said to me ‘Kerry, you need to think less’. Simple but it was a bit like a lightbulb moment. I have a lot going on at the moment, working notice is my current job, preparing for a new job, wondering where I am going to live, house hunting, some personal issues, packing, the list goes on. When my friend mentioned the idea of thinking less, I thought I had to try it. Combined with my other insomnia busting tricks listed below, I had a fantastic night’s sleep and was woken by the light shining through the gap in the curtains. I had even slept through my alarm. Here are some of my old and new tips to combat wide eyes at night. Now all I have to do, is remember to follow my own tips. Work out how long you need to sleep – I need around 6 hours. At one stage I was so tired I was heading to bed around 10 exhausted and then of course I was awake and tossing and turning from about 4 am. I tend to aim for 11.30, have a little read and then lights out. My alarm goes off at 6 and then I have the choice of a little slumber before hitting the shower. Bath before bed. Nothing like it – it is a real treat to run a hot bath with some nice lavender oil and relax while soaking. Straight into bed after that and out like a light. Read about my bath time ritual here. No screens in the bedroom. My TV is downstairs, as is my laptop and iPad. Work is not for the bedroom. I am still guilty of this as I keep my phone by my bedside. Apparently the light mimics daylight and tricks our brains. I really must try to plug it in downstairs and leave it. Not quite sure I am ready though. Crisp clean sheets. If I have been having a bad patch, that hot bath is followed up with a slide into crisp clean sheets. There is nothing worse than being cold. I have an underactive thyroid and this sometimes means my body cannot get warm. I love my electric blanket and even admit to using it on the chillier nights in the summer. Aroma moments. Aromatherapy is a hobby for me. There are always little bottles around the house for one remedy or another. While lavender is an all time favourite, for sleep I use german camomile. The tip was given to me by a friend years ago. It is bright blue! Put a few drops on a hankerchief or cloth and tuck it under your pillow. Sweet dreams ensured. Think less – finally added to my list. Empty your mind and remind yourself that your worries and thoughts will still be there tomorrow. It is time for sleeping now not thinking. I have even read about the idea of writing things down in a book – and leave them there for the night. So now will wish you sweet dreams.